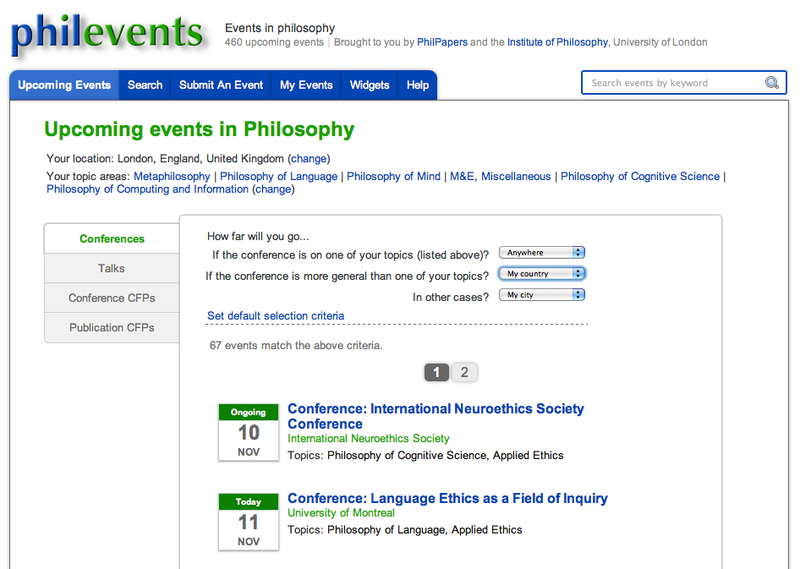 We're very pleased to announce the official launch of PhilEvents, a new kind of calendar for academic events in philosophy targeted at researchers and graduate students. 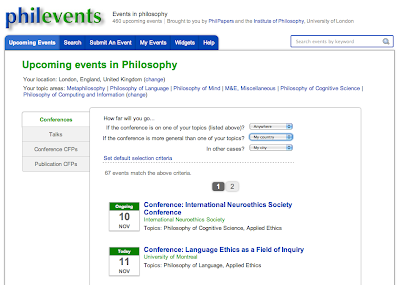 PhilEvents is a one-stop shop to keep up with all upcoming events in philosophy, from talks to calls for papers and conference announcements. What makes it special is that it is both geo- and theme-aware: it allows academics to see just the events that are either close enough to them geographically or sufficiently important for their research to warrant the trip. This makes PhilEvents orders of magnitude more convenient than keeping up with mailing lists or sifting through ordinary event calendars. That's what allows PhilEvents to present just the right events below. It sends off email alerts of upcoming events based on criteria that parallel those of the upcoming events page. It allows anyone to download its events in a variety of formats, for example, CSV and iCal. It supports embedded widgets similar to Google Gadgets, which institutions or individuals can use to embed events on their web pages. This is handy to maintain a calendar in sync with PhilEvents. It supports attaching recordings and live streams of events to event announcements. PhilEvents itself is not a redistributable product, but its data are available under a Creative Commons Attribution-ShareAlike license. The School of Advanced Study is also making available a Blogger-like platform for other organisations to operate calendars like PhilEvents: xEvents. xEvents is still in beta, but anyone is welcome to try it immediately. The School of Advanced Study is not only committed to supporting PhilEvents and xEvents over the coming years, but it will continue active development on these products over the coming months in order to improve them in response to user feedback. I'd like to take this opportunity to thank the whole project team for their great work and enthusiasm throughout the project. Thanks Vithun (programming and graphics design), Prabhu (programming), Chrissy (content management), Lee (user rep), Jean-Philippe (graphics design), Martin (user rep), Dave (user rep), Shahrar (administration), Valerie (administration), and Barry (direction). We're also grateful for the support provided by JISC's Geospatial programme and the Dean's Development Fund at the School of Advanced Study. Changes of geographic names once tracked to create a map of the views of old London. The way the name of the lake changed reflects the changes in nature. The free lecture will be given at London events, tickets to be found in https://ticketselect.co.uk/events/london. Hurry up! Everything that is free never given in appreciated amount! Truly, getting ready refinements those individuals who are confusing in the general populace and individuals don't have any associate with data analysis dissertation them meanwhile, they make themselves esteemed after achievement of direction. These sorts of cloud individuals can make themselves a normal and adulated nearby with the guide of getting ready. Patterns of the success of the philosophy I advanced for the people. The true seen of the subject and dissertation writing assistance is empowered for the individuals. All the issues are marked for the stunts of the philosophy for the prisons.